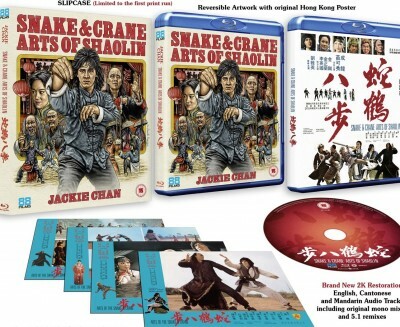 Released in 1978, the madcap mayhem of SNAKE & CRANE ARTS OF SHAOLIN was a surefire sign to audiences that its young star Jackie Chan was soon to be even more famous than the man who paved the way for the modern martial arts genre - Mr. Bruce Lee! An international box office success, this all-time classic is one of Chan's most beloved masterworks and it is easy to see why. The fights come thick and fast in this relentless tale of a young kung-fu student with a very unique style - which attracts a series of curious competitors! Helmed by the great Chen Chi Hwa, who also oversaw the Chan classic SHAOLIN WOODEN MEN (1976), 88 Films is proud to present SNAKE & CRANE ARTS OF SHAOLIN in glorious HD thanks to a brand new 2k scan overseen by Golden Harvest itself!